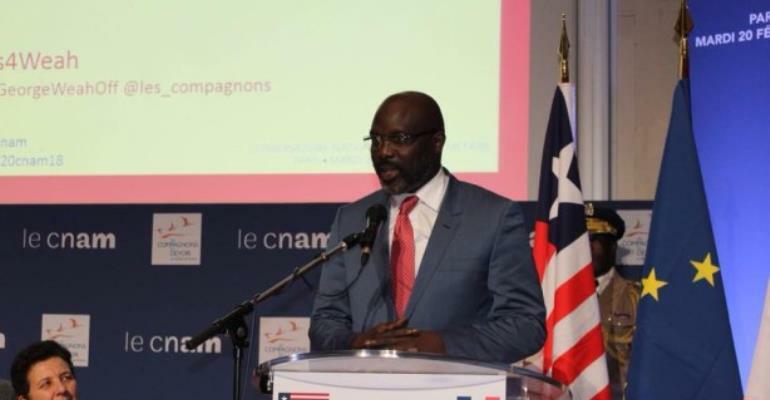 Liberia: Was George Weah Wrong To Speak French In French- Speaking Countries As President Of Liberia? Many individuals have viewed that Liberian President George Weah was diplomatically wrong to speak French when he visited French-speaking countries recently. He visited Senegal, Morocco, and France. Critics said that as president of an English speaking country, he should have spoken English. They also pointed out that his action violated diplomatic protocol. I disagreed. But before I give my reasons, I want to discuss briefly Liberian diplomatic history and international relations. Liberia's entrance into world politics and diplomacy was relatively recent. Although the country gained independence in 1847, she was an infant state among established Western nations, specifically Britain, French, and America. She lacked the education and proper ability to compete equally with the Western World. This inadequacy was evident when she could not represent her interest by her own citizens but by foreign nationals. This was because the Black settlers and ruling elites of the country were former American slaves; the majority of them were uneducated and lacked proper administrative ability and skill. In addition to the dependency on foreign nationals for external representation, internally she relied on the importation and recruitment of skilled Blacks from other countries to Liberia to help administer the country. Liberia advanced internationally particularly in the mid-1900s as she became a beacon to other African countries seeking independence. But her dependency on foreign nationals for representation increased, as she established diplomatic relations with more Western countries. Cognized of this deficiency, in the 1950s she established the Liberian Foreign Service Institute to train Liberians for diplomatic service. Liberia was a founding member of the League of Nations and the United Nations, which succeeded the League. The country plays an important role in world politics and diplomacy. President Weah did not violate diplomatic protocol forbidding visiting diplomat or head of state from speaking the language of the host country. His action was right. Specifically during the colonial era, English and French were the leading languages for diplomatic relations. It was a plus for a leader or diplomat to speak both languages. As it is now, a diplomat from an English speaking country and who is fluent in French can comfortably speak French in his/her French-speaking accredited country. The same is vice versa. A bi-lingual leader or president can do the same when visiting. He/she can speak in the host's language in their private talk. When both leaders come out in addressing the press, each leader can, but not a most, speak in his/her country's official language, summarizing the discussion and may answer questions and may add some personal touch. It is this summary that is reported in the media for national and international broadcast. Each leader may have a report in his/her official language of the private discussion for the record. But that is not a rule; it is convenient. Language is important in diplomatic communication and relations. Leaders like to be comfortable with each other. It is much better if they can speak the same language. Further, when a visiting leader speaks one or two sentences of the host country's language, that may be done out of the friendly respect and courtesy of the language but mostly the leader does not know how to speak the language. Some leaders would be glad to communicate in the language of the host, maybe for a stronger friendship and understanding. Liberian former President William Tubman would have loved knowing how to speak French. He was close to Ivorian President Houphouet Boigny and also to Guinean President Sekou Toure, neighboring leaders. As stated in an earlier writing on this matter, Liberian Ambassador Dew Mayson accredited to France spoke French in Paris. But prior to him, Ambassador Prince Brown, who was fluent in French, spoke French in official discussions in France. Both ambassadors did so because of their language ability, which was an added value. When Liberia was represented by foreign nationals, most of the representatives spoke in the language of the residence countries. That was not only customary but also effective. The representatives reported in English to Liberia regarding their representation. International norms or law are functions of conventions, treaties, customs and other practices. The Vienna Convention of 1961 and 1963 respectively sets modern diplomatic protocols and did not restrict the right to speak the language of the host country. Certainly, such restriction would be a human right violation. Most Liberian diplomats during the 60s to the 80s and now did not have the language ability. Neither did most Liberian presidents. Weah is the first Liberian president to speak more than two major languages. This should be commended. Unfortunately, what is viewed internationally as positive for him is considered by some Liberians as negative. Seemingly, some Liberians have not yet realized that the election is over and Weah had won and is now the president. But on the other hand, criticizing now, though may be unnecessary and unhelpful, could strengthen him internally and make him work harder and focus for success. The end victory is sweeter than early praises, flatteries and cheers. I think he knows this. I repeat to the best of my knowledge, there is no set rule that a visiting leader who is fluent in the language of his host should not speak in the host's language. Although Weah represented Liberia in his visit and Liberians should know what was discussed, a summary of the discussion was stated in English or interpreted in English. What matters is the result of the visit, its benefits to Liberia and people. Diplomacy is dynamics; it is constantly changing as new nations enter the arena of international politics and new relations are built. What might be useful in the past is replaced by new and different behavior. For instance, in ancient time, people of nobility represented their countries and did not reside in the host countries. Now the ambassador, from any social class, resides in an embassy with a country team working at the chancery. Another example, Liberia in the past depended heavily on the US and did according to the desire of America. Now Liberia has extended relations to the East and other parts of the world and therefore making new friends. Liberia recently in the UN voted against US recognition of Jerusalem as Israel capital. To conclude, Weah's speech in French did not violate diplomatic norm or protocol. There is not an agreed rule on the subject. Review of Liberian diplomatic history would applaud President Weah for his language ability. Diplomacy is changing, the world is changing, and new relations are built on common language, interest, understanding, and value. This author has authored 26 publications on Modern Ghana. Us Presidential Election 2016: Who Will Win? Liberian Presidential Election 2017: Who Will Win?